Located at 501 N. Hill Street, the Fort Moore Pioneer Memorial is the largest bas relief military monument in the United States that is located at the actual site it commemorates. Originally dedicated in 1958, the monument features a terra-cotta memorial wall, an 80 foot waterfall, and a pylon/flag pole. The memorial wall depicts the first United States flag raised in Los Angeles in 1847 after the Mexican-American War, and the monument itself is located at the site of the original Fort Moore where LA residents celebrated the first Fourth of July after Los Angeles became a part of the Union. In addition to the flag-raising, the memorial wall depicts eastern pioneers, post-indigenous Spanish ranchos, a prairie schooner (type of covered wagon) that brought some of the first eastern settlers to California, as well as the an image depicting the influence of Water and Power on the modernization of the region (emphasized by the waterfall which originally ran nearly night and day). The monument was spearheaded by influential members of the Daughters of Utah Pioneers who were themselves decedents of members of the Mormon Battalion depicted on the monument. In 1949, they persuaded the LA County Board of Supervisors to build the monument on artistic and logistical grounds: Artistically, the surrounding area was undergoing drastic changes due to Civic Center development and there was an interest in large-scale Los Angeles monuments associated with civic history. Logistically, the Civic Center development (including the construction of the Hollywood Freeway) required a concrete retaining wall on the east side of the Fort Moore Hill. The result was the Fort Moore Pioneer Memorial. But before construction could begin, the Fort Moore Pioneer Memorial Advisory Committee (composed of influential Angelinos, including Dorothy Chandler and John Anson Ford) held an architectural competition to choose a design for the Memorial. The Committee received 77 entries to the competition, eventually choosing Kazumi Adachi and Daisuke Dike Nagano of Los Angeles. Construction on the project began on June 23, 1953. As construction began on the wall, the Committee held a second competition seeking suitable sculptural design for the bas-relief to be hung on the south wall of the monument. Submissions were required to depict: 1.) The raising of the flag in 1847, 2.) development of water and power in the region, and 3.) depictions of early California agriculture and transportation. It was also required that the artwork be legible from a distance and clearly convey the events in question to a public who may not be aware of the history. As part of the competition six finalist were identified: Arch Garner, Merrell Gage, Raoul Josset, Henrey Kries, and Lee Lawrie, with final award going to the internationally renowned Kreis. The monument was completed in 1957 and dedicated in 1958. For the last 60 years it has remained largely untouched while the surrounding area has continued to develop, leading (unfortunately) to damage and neglect. 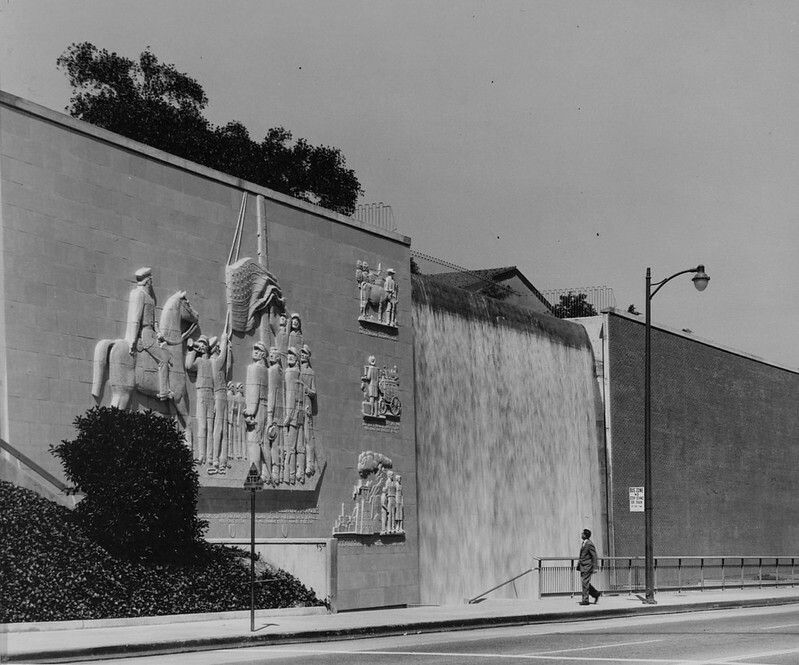 In 1977, as part of efforts to combat a state-wide drought, the 80 foot waterfall at the center of the memorial had to be shut off. Over the next forty years the monument suffered continue damage due to time, the elements, seismic activity, human interaction, and general neglect. For a time, it seemed that the monument was destined for a fate akin to that of the wonders constructed by Percy Bysshe Shelley’s great and terrible Ozymandius. But all that changed in 2014. American Architects Kazumi Adachi and Daisuke Dike Nagano were both educated in architecture at the University of Southern California. While they collaborated on the Fort Moore Pioneer Memorial project, they also both had architectural practices of their own. Adachi is known for the Kazumi Adachi House in Beachwood Canyon (his personal residence until his death), a celebrated home in Grenada Hills, as well as contributing to the design of the Japanese American Community and Cultural Center in Little Tokyo. Daisuke Dike Nagano designed a number Los Angeles homes in areas such as Marina Del Rey and the Crenshaw Square Shopping Center—once a beacon for Japanese-Americans who settled in Crenshaw District after World War II. A Connecticut-based, German-born sculptor, Henry Kreis (1899 - 1963) designed the most notable feature of the monument: the large terra-cotta memorial wall. Kreis’s stylized design depicts American troops raising the flag, and a series of flanking vignettes show regional scenes of orange groves, cattle ranching, and water and power systems. Kreis’s panels were fabricated by Gladding McBean who have produced a number of architectural terra-cotta works throughout Los Angeles and Southern California since the 1930s. Albert Stewart (1900 – 1965) oversaw the design and fabrication of the terra-cotta memorial wall as well as designed the artwork for the pylon and flag pole area of the memorial. He was born in London and emigrated to the US as a child with his family. He studied at the Beaux Arts Institute and the Art Student’s League in New York City, and served as an assistant to sculptors Frederick MacMonnies and Paul Manship before he began sculpting in the 1930s. Stewart taught sculpture at Scripps College in Claremont for 25 years. Notable works include figures on the Scottish Rites Temple on Wilshire Boulevard and on the exterior of the Life Science Building at UCLA. In 2014, riding a wave of development based around the north end of LA City’s Civic Center (including renovations to the Hall of Justice and Grand Park), the Board of Supervisors approved $4.1 million to restore the monument. That number was later increased to $5.5 million with the addition of $500,000 from LA City Council. The project was originally projected to take four years and aimed to repair damage to the memorial wall, railing, and waterfall tiles while also replacing the waterfall pool and retrofitting the piping to allow for adjustable water flow to make the feature more environmentally responsive. On December 13, 2018, the waterfall was turned on again for the first time in almost 42 years. As part of the renovations on the monument, LA County Public Works crews unearthed a time capsule from 1958 located in the monument’s flag pole. The time capsule held everything from photos to county documents of the time, and allowed for an unrivaled glimpse into the original monument construction process. In keeping with the spirit of the renovation the Arts Commission is working closely with an advisory group comprised of community members from across the region to solicit public submissions for a time capsule from 2019 to be sealed in the base of the flag pole during the re-dedication ceremony on July 3, 2019. The intent of the time capsule is to capture stories, memories, and mementos that are culturally, geographically, and historically representative of the rich diversity that comprises LA County today.